T7 Training are the professionals for onsite training courses in your office Australia-wide whether in Sydney, Melbourne, Brisbane, Canberra, Perth, Adelaide, Darwin, Hobart and all country-Australia locations. We run inhouse training for Microsoft Excel, Project, PowerPoint, Word, Outlook and Publisher with Office version 2016, 2013, 2010 and 365 as well as Office 2016, 2011 and 365 for Apple Mac. We also provide onsite training courses for Apple Keynote, Adobe InDesign and Adobe Photoshop. T7 Training Systems is the complete solution for your Microsoft Office, Apple and Adobe skills. All pictures are from our actual onsite training sessions. Our pricing is much cheaper than sending your staff to public training courses and being a private session at your office, we can personalise the training course if you like, precisely to your requirements and at no extra charge. We are proud of the consistent positive feedback we've receive over our 15 years of experience. Our clients are invariably overjoyed with our high quality training service and we receive great feedback even months or years later. You can view some of our training feedback by clicking here. Stand out from your competitors by having your staff learn how to produce higher quality work. We ensure all participants leave our onsite training feeling empowered and you will love the quality and efficiency improvement in the skill levels of your staff and the output of your business. We travel to your office and set up our portable training equipment in your meeting room. 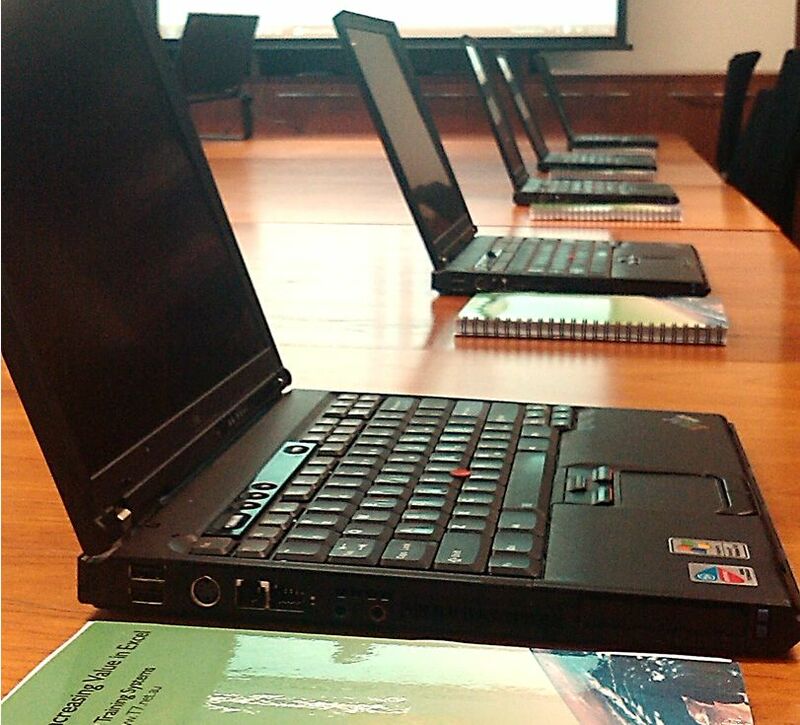 We supply training laptops, course books, notepads, pens and a data projector (if required). We even bring extension cords and powerboards so you don’t have to worry about a thing. At the end of the inhouse training course, we pack everything away leaving your meeting room clean and tidy. We can personalise your course and course book subjects at no extra cost, so your staff can receive precisely the training they require. Most clients request our standard courses as we have created the perfect training sessions over 15 years of experience including commonly requested subjects such as VLOOKUP, PivotTables, Mail Merge, Paragraph Styles, Master Pages and more.